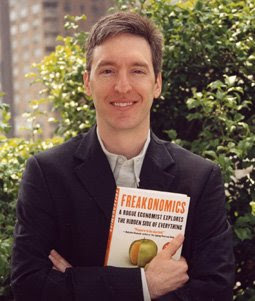 the nytpicker: Steven Levitt's Pal Gets Free Ad On Freakonomics Blog. It Just Looks Like A Real Post. Steven Levitt's Pal Gets Free Ad On Freakonomics Blog. It Just Looks Like A Real Post. You can't blame University of Chicago economics professor John List for soliciting coverage of his wife's website from his colleague, famed Chicago economics professor Steven D. Levitt. You can, however, blame Levitt for cheapening his Times "Freakonomics" blog with a shameless plug for the website, which sells children's clothes and has nothing to do with Freakonomics, or journalism. It's a free ad. After putting the business's name in the title -- "Seven Smooches" -- Levitt takes a lame stab at representing the endorsement as a piece of journalism, by casting it as a story about entrepreneurship. "Imagine for a moment that you are a stay-at-home mom with a workaholic husband, five kids between the ages of two and nine, a new dog, and almost no babysitting help," Levitt writes. "What would you do?" But as millions of web entrepreneurs already know, what the wife of Levitt's colleague did -- start a web business -- isn't exactly original. How about start up a new business? That’s what Jennifer List, wife of my colleague and co-author John List, did. The result is Seven Smooches. They make handcrafted, one-of-a-kind clothes and accessories for children. Although they are just getting started, they have already been featured in Country Living and Real Simple magazine. Rumor has it that Halle Berry and Courteney Cox Arquette’s daughters wear Seven Smooches. Word to the wise: if you want it delivered by Christmas, you better order it right away. After all, Jennifer (and her business partner) hand-make everything, she has five children, and her husband is a workaholic. Another word to the wise: if you're a pal of Steven Levitt and you want your website business promoted before Christmas, you better order your post right away.